IHPR founder Alexandra Villa grew up going to boxing matches with her father Pete, whose idea of a wholesome and inspiring family outing was taking the entire family to the San Francisco Cow Palace in the late 70s and mid 80s to watch Roberto Duran (Manos de Piedra /Hands of Stone), Carlos Palomino, Marvin Hagler, Gerry Cooney, George Foreman and Michael Spinks fight. She was 10. With the advent of VHS and DVDs Villa spent many a night watching and getting schooled by her dad on all the great boxing legends including Cassius Clay (Muhammed Ali) Jerry Quarry, Joe Frazier and the like. To this day, if Canelo Alvarez or Genady Golovkin (Triple G) are fighting, its a given that she will be watching it with her dad. That morphed into an absolute passion for all things UFC which began in 2014 when then UFC Women's Bantamweight Champion Ronda Rousey attended a LA Kings playoff game and the the crowd went wild. Villa started watching everything UFC- and was hooked. IHPR's founder watched UFC 194 ( where middleweight challenger Luke Rockhold beat the previously undefeated champ Chris Weidman) in a stunning fourth round TKO with Weidman taking a brutal beating at the hands of the native Californian. The devastated Weidman campaigned UFC for a rematch, and he will have it on June 4th, 2016, as the two middleweights meet again as they headline UFC 199 at the Forum in Los Angeles. Rockhold - currently ranked the #1 middleweight and #3 pound-for-pound fighter by Sherdog -will be defending his Middleweight belt for the first time against the formerly undefeated champ and is favored by Vegas oddsmakers as a -175 point favorite to defeat Weidman just as decisively again. 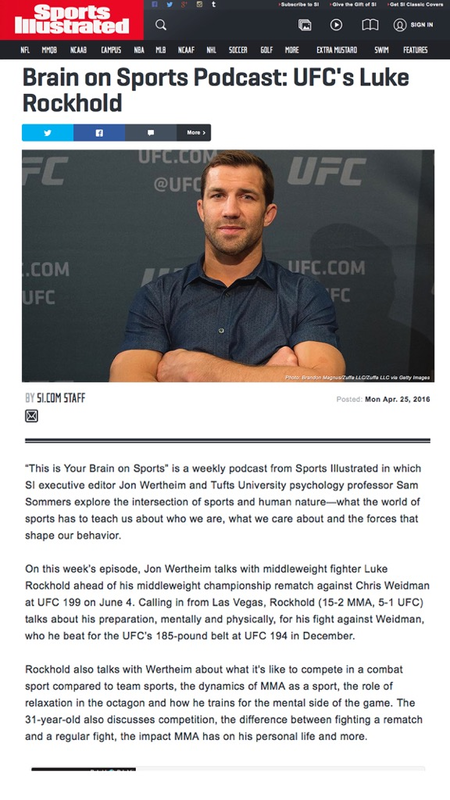 In April 2016 Villa reached out to Luke's American Kickboxing Academy team - the renowned training facility that boasts current UFC Light Heavyweight champion Daniel (DC) Cormier and former two-time Heavyweight champion Cain Velasquez- and booked a Sports Illustrated podcast with SI executive editor and UFC fan, Jon Wertheim.